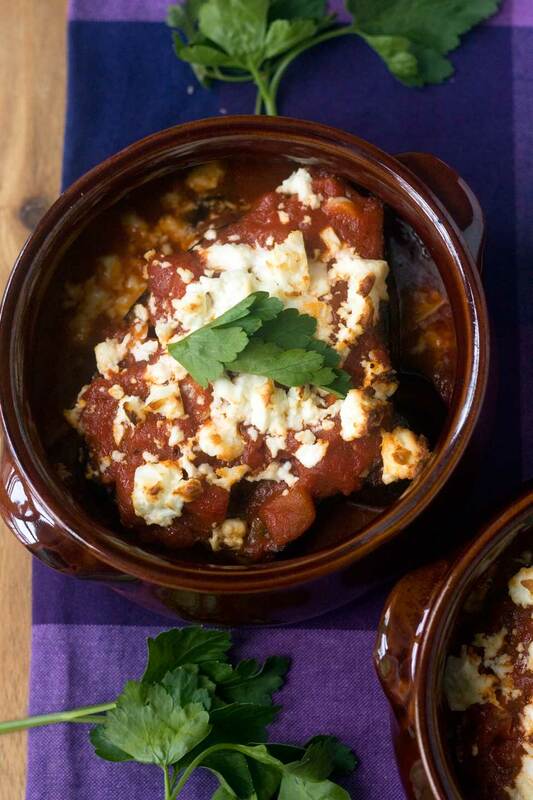 This Greek baked eggplant with tomato sauce & feta is a great healthy (& gluten-free!) appetizer or accompaniment to grilled meat or fish. It might seem simple, but it’ll send your taste-buds soaring … promise! At the risk of sending some of your cursors racing straight to the cross in the right hand corner of your screens, I’m going to tell you about yet another meal that Mr. Scrummy and I had at a restaurant in Greece one time. As we got ourselves all comfy on our nice snug corner table, we started leafing through the menu and our hearts sank a bit. You see, the menu was the type that had garish, unappetizing pictures of some of the food. It was also well-worn and even a bit sticky in places. The food sounded very average, too, quite frankly. There was really nothing all that special-sounding. But obviously you can’t judge a menu by its sticky pages and tacky photos because one of the appetizers we ordered alongside our tasty meat sharing plate was something very close to the baked eggplant with tomato & feta cheese that you see here in today’s post. As delicious as the meats etc. were, we both agreed that the eggplant side dish was the runaway show-stealer! Lucky for myself and Mr. Scrummy (and for you!) we took the chance to ask our waiter how the baked eggplant was made. He told us that the eggplant is first baked in the oven by itself with a little olive oil, then tomato sauce is poured over the top, followed by crumbled feta cheese, before the dish is put back in the oven to finish off. So simple that I didn’t even need to jot it down. Later, while grabbing some last minute items to take home with us at a local supermarket, I spotted the cute little brown dishes with lids you see in the photos. They are just perfect for baking this delicious Mediterranean side dish in, don’t you think? And all for the thrifty price of about 3 euros each! I made my own slightly guessed version of this easy aubergine dish and Mr. Scrummy and I ate it alongside some greek lemon chicken and potatoes leftovers and again … it was the star of the show. I think it would be just as delicious eaten by itself with some crusty bread (or grilled garlic bread … mmm … unless you need the meal to be gluten-free, of course), or as a side dish alongside some grilled meat or even fish. So how long do you bake eggplant for? 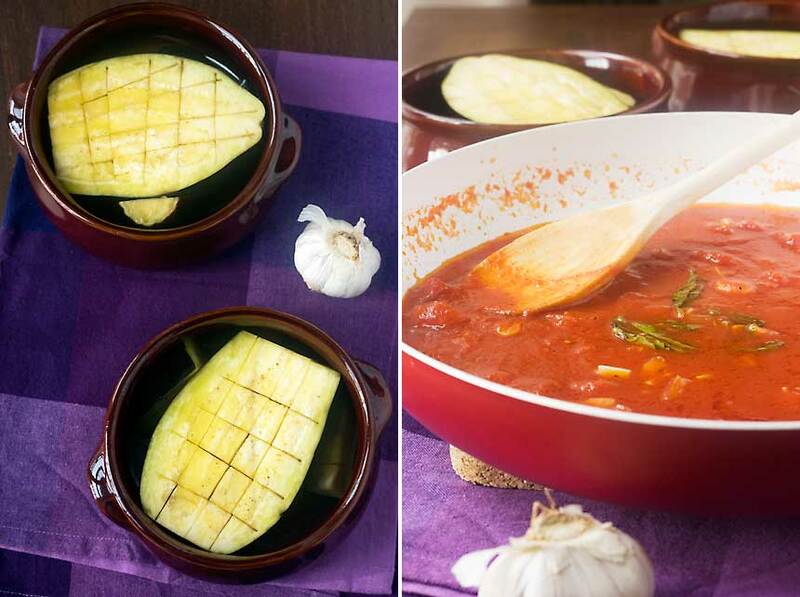 It depends on the recipe of course, and the way you slice them, but for this recipe you initially bake the eggplant uncovered for 45 minutes (after slicing it in half and scoring it in a criss-cross pattern). Then, you pour the tomato sauce over it and bake again for another 15 minutes. So all in all this version of baked eggplant takes an hour. This might sound like a long time, but you really do want that eggplant to be nice and soft. And trust me, it’s worth it. This really is simple vegetarian Mediterranean food at its best! 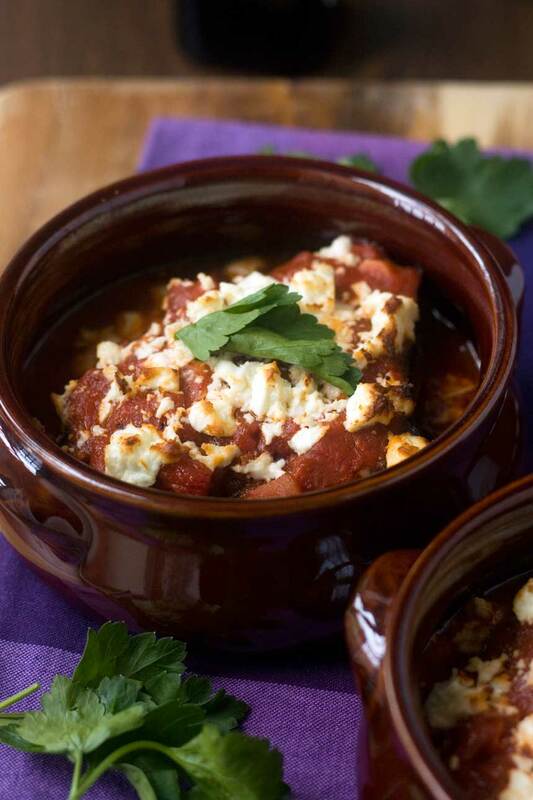 A simple Mediterranean side dish of baked eggplant with tomato sauce and feta cheese. Perfect served with grilled meat or by itself with some garlic bread on the side. Pour the tomato sauce over the aubergines, then crumble over the feta. Bake for about another 15 minutes or until the tomato sauce is bubbling. Always so jealous of your Greek food adventures. Eggplants are underused in my kitchen which after looking at this, I realize is a damn shame! I must admit that the intention is to make you a bit jealous, Chrissy! But then again I am jealous of all your virtual travelling adventures, too. You come up with some amazing recipes! Hello! I’m so glad you like the look of this recipe and really hope you do give it a go. It’s definitely one of our favourite meals. I’ve served it with sausages, with meatballs or just by itself with toasted bread. Any way is delicious! I actually picked up the little dishes from Greece. They were incredibly cheap – only about 2 euros each if I’m remembering correctly. You can use any small baking dish you like, or even a bigger one that fits both in together if you don’t have any smaller ones. P.S. To make this an even easier meal, I sometimes make the tomato sauce separately. I make a double batch, using half for this recipe and saving the rest for some simple tomato pasta. Hi, Ilona … thanks for pinning! Love the story, so true, we shouldn’t judge a restaurant by the not so good looking pictures on the menu. 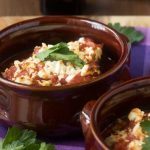 I’m glad you are posting Greek recipes, because I love Greek food, it is close to what we cook in Bulgaria. Love egg plant and this dish looks flavorful and delicious!!! This is so true … in Greece, at least. I think in the UK I’d be rightly suspicious of bad menu photos … tee hee! There are so many restaurants that I’m sure I haven’t eaten in because their website photos were TERRIBLE…the same probably goes for restaurant menu photos! I guess you can’t judge a book by it’s cover though…and I’m certainly glad your eating experience inspired this dish, because YUM. The greeks are kings of this kind of thing! Terrible photos and English translations, but delicious food 9 times out of 10. Glad you approve of the baked eggplant! I will never tire of you Greece stories and I love the food inspiration you get. What a delicious dish, my husband is a massive eggplant fan so I’ll be making this for him soon. This looks seriously amazing! I loooove eggplant! Hi, Brittaney! Thanks for passing by and taking the time to comment. Glad you like the eggplant! Thanks for the compliment, Kathleen! And what a great idea to do an eggplant round-up. I think a lot of people assume they don’t like them and if they do don’t really know what to do with them. I’ll add that one to my ideas list! I could easily eat this baked eggplant for my entree! I’m glad you ended up with a delicious meal after all! Hi, Liz … really happy you like it! Have a great weekend! Oh, do give it a try, Rachel! If you like, you can eat it by itself – just with some nice fresh bread. It’s that good! I’m always looking for new ways to cook eggplant and this looks fabulous! Thanks, Marissa! Hope you give it a go some day! I’m loving on eggplant right now, love this dish! Hi, Cheri! 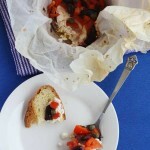 So glad you like this … I fell in love with eggplant when I first went to Greece! My husband and I were just talking about eggplant yesterday! I was reminding him that he probably likes it, he was trying to remember when I cooked it last, and we both agreed I needed to make it again soon. So thank you, Helen, for providing a delicious, cheesy rendition that we can dive into. It’s always fun to hear about your travels, too! Hi, Meggan! Oh, I’m so happy to have chimed in with this recipe just at the right moment! Please do let me know what your husband thought if you do give this a go. I would challenge any eggplant-hater not to like this! I don’t think I could ever take the cursor to the ‘x’ button! Your stories are sooo cute!!! <3 I love how you guys accidentally came across this dish and it ended up being the best one! And I absolutely don't doubt it, it looks AMAZING!!!!! I love how the interiors of the eggplant turn all molten and delicious as it cooks and topped off with tomato sauce and feta cheese is is just unbelievably delicious! I sooooo Need to make this! Hi, Samina! Thanks so much for your enthusiasm about this dish .. and for the compliment on my stories! You’re so sweet! I bet the salty feta cheese is really nice with the aubergine. Great recipe! Hello! Thanks so much for passing by and taking the time to comment. You’re right about the feta in this dish, although in my opinion almost everything tastes a little better with feta! Helen I see myself making a double or a triple batch of this as it would disappear quickly I am sure! Wow, what a compliment! Thanks, Lorraine! Oh man, I totally know those types of restaurants… with the offensively terrible photos and sticky menus… ugh. Glad to know that this one was a gem!! This eggplant sounds amazing. So comforting! What a gorgeous dish, Helen! I don’t eat eggplant too often, but do love it. The tomatoes and feta seem to go perfectly with this. Such a good comfort food meal! Hi Gayle … thank you so much! I ‘forget’ how lovely eggplant is, too, sometimes. It’s a little Mediterranean gem of a veggie, that’s for sure! Ahhh … I’m rumbled!! Yup, eggplant does melt in your mouth. If it’s cooked well, it doesn’t need too many other ingredients to make it shine! HI Helen, I am always looking for new ways to cook eggplant, it’s just my favorite (well, one of them!) I’m impressed that you asked the waiter how it was done and that you got an answer. Good for you!! I need to do that more often and not be intimidated. As always, this dish looks absolutely fabulous and I can’t wait till eggplant in on sale at the market so I can make it. Greece sure sounds like it serves up great food!!! Actually, that was the first time I’d done that, Laura! I guess the food was so simple and homemade-like that I figured they wouldn’t mind sharing the recipe. I should do that more often, though! Glad you like this, Laura. These aubergines were out of season ones, but oh well! I only needed one! You know what they say…”Can’t judge a menu by its….” well, it goes something like that! This dish is speakin’ my language!! Love it, Helen! It will definitely work, Marcie. Just choose a nice sunny day and sit and eat it outside … lol! Haha I don’t think I could tire of hearing about your Greek travels + eats! This dish sounds so comforting. So many of my favorites in here! Thanks so much, Jess! Wow, that’s a compliment! Me too, Denise … I think I eat far too much feta actually, but oh well … at least my food is delicious! Hello Simon! Really hope you do try this – we love it… it’s good either with a side of meat or fish, or just on its own with bread! This is THE tastiest aubergine dish I have ever made. It tastes so much better at room temperature too. I even enjoyed it cold the next day. 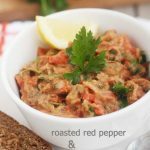 It has become one of my weekly staples and everyone I cook it for asks for the recipe. I made a batch last night using three aubergines. I can’t wait for the leftovers tonight. I normally serve it with green beans and a cheesy garlic ciabatta. Delish! I’ve been agonising over the Greek name of this dish! Could you remind me please? This was delicious!!! Thank you for sharing the recipe! Thanks so much for the feedback, Mijke! This really is one of our favourite recipes and I’m so glad you enjoyed it too. Quite simple but delicious! We are not gluten free and this recipe was a hit with the whole family! So happy to hear this, Sarah. Thank you so much for letting me know! Oh that’s so good to know, Linda – I really hope you and your Mom-in-law enjoy it as much as we do! Amazin recipe! I’ve never tryed the feta cheese and now I’m adiccted to it. Thank you!!! You’re welcome, Sergio! There are so many delicious recipes with feta cheese for you to try – you’ll never look back! Try this pumpkin, chorizo and feta salad or this spinach and feta filo pie!